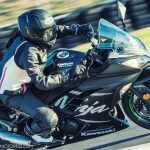 Kawasaki proudly introduces the new Ninja 400 delivering greater performance than its predecessors. When the 2008 Ninja 250R was introduced it was the only model of its kind, offering top-class Ninja styling in a fun and friendly package but quickly became popular among new riders, young riders and women motorcycle riders. 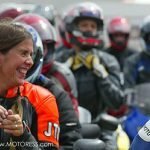 It equally resonated with both new and experienced riders, launching a worldwide movement. In the ten years since its release, the number of full-fairing rivals has increased exponentially, making this one of the most hotly contested categories in the market. 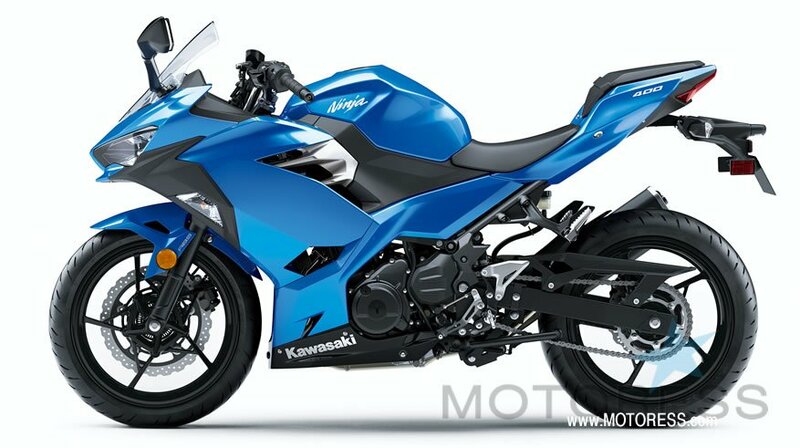 The Kawasaki Ninja 400 all-new engine and chassis that are more powerful and significantly lighter. But like the Ninja 300 that preceded it, this new Ninja model possesses much more than high performance. Not only does the Kawasaki Ninja 400 offer stunning, high-quality looks, its stronger engine performance, light, predictable handling and relaxed, sporty riding position make it both fun and easy to ride. This duality – the ability to offer excitement and ease of riding to wide range of customers – is sure to make the new Ninja 400 a fan favourite once again. The Ninja 400 all-new 399 cm3 engine delivers a balance of performance and controllability. The new engine offers increased performance at all rpm compared to its predecessor. Smooth, predictable response contributes to an easy-to-control engine character. Thanks to its efficient design, the compact, lightweight engine has a size on par with 300cc engines. 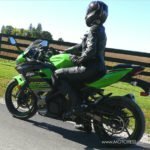 Powerful, Rider-Friendly Parallel Twin The higher performance can largely be credited to the new downdraft intake, which is accompanied by a larger airbox offering increased intake efficiency. The increased performance is complemented by a rider-friendly character; the smooth response and abundant low-end torque facilitate throttle control for new and experienced riders alike. New Assist & Slipper Clutch More compact clutch (139 mm >> 125 mm) with less rigid operating plates offers a 20% lighter lever pull. Complementing the extremely light feel at the lever, the new clutch has a wider engagement range, facilitating control. New Radiator Fan Cover A cover for the radiator fan directs engine heat away from the rider, contributing to rider comfort. With the new design, hot air is now mostly routed out to the sides (through holes in the fairing). Offering much weight savings compared to its predecessor, the new chassis delivers a balance of stability and light, easy manoeuvrability. Its slim design facilitates both control and ease of riding, making the Ninja 400 an easy choice for both new and experienced riders. Lightweight Trellis Frame – The Ninja 400 features a trellis frame similar in design to that of the Ninja H2. 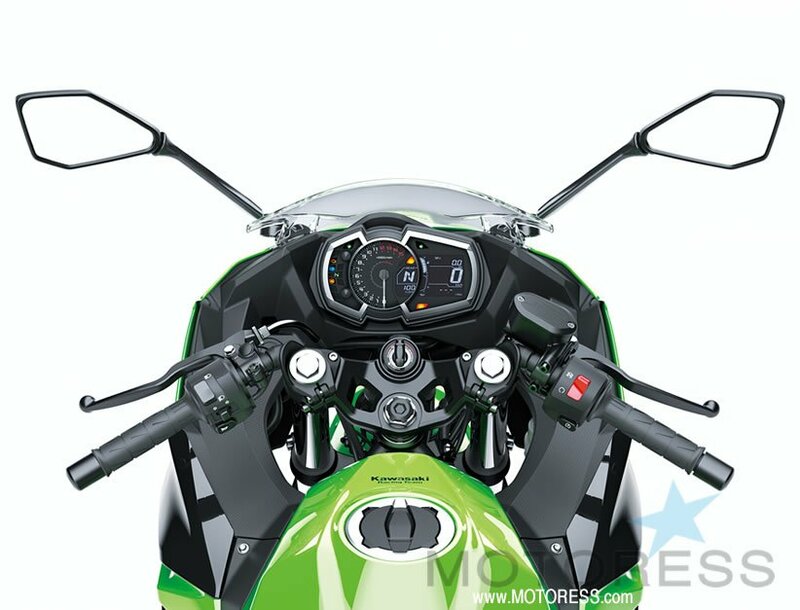 Kawasaki’s advanced dynamic rigidity analysis was used to ensure optimum rigidity with light weight. The engine is rigid-mounted and used as a stressed member. The new frame design contributes significantly to the bike’s low curb mass. Swingarm Mounting Plate – Like the Ninja H2, the new Ninja 400 features a Swingarm Mounting Plate. Allowing the swingarm to be affixed to the rear of the engine contributes to stability and helps with weight savings by eliminating the need for heavy frame cross-members. Light, Predictable Handling With both the engine and frame being new, engine placement could also be optimised. The new chassis has a supersport-style short-wheelbase/long-swingarm design, complemented by a steep caster angle that delivers light, natural handling. The bike’s light weight also contributes to the easy handling and facilitates manoeuvring when off the bike. Significantly Lower Weight – the lightweight design of the new engine and frame, plus extensive efforts to minimise weight result in a curb mass of only 164 kg (361.6 lbs) for the Ninja 400 – weight on par with single-cylinder models. More Rigid Front Fork – More rigid 41 mm telescopic fork delivers better suspension action. The front wheel feels really planted, direction changes are made easily (even when the bike is fairly upright – handy when navigating traffic jams), and overall the suspension offers the plushness of a larger displacement bike. 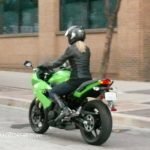 Largest Brake Disc – in Class Measuring 310 mm (the same disc size used on the Ninja ZX-14R), the Ninja 400 semi-floating front disc offers sure stopping power. A rigid new front brake master cylinder helps eliminate ineffective (idle) stroke, contributing to controllability, while carefully selected brake hose dimensions and material contribute to brake touch. ABS models feature the latest ABS unit from Nissin, the most compact and lightweight available. Relaxed, Sporty Riding Position – Relaxed rider triangle accommodates a wide range of rider sizes and riding situations. 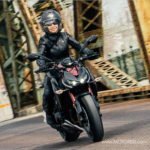 Compared to some other competitive models, whose somewhat extreme riding position compromises comfort, the elevated handle position and slightly foot-forward foot peg position put the rider in a position to control the bike while also offering rider comfort. Easy Reach to the Ground – While seat height is 785 mm, the slim design of both the seat (30 mm narrower) and the rear of the engine gives riders an unobstructed line for their feet to reach the ground. Superb Ride Comfort & Excellent Wind Protection – Low vibration and seats with thick cushioning and low-rebound urethane contribute to superb ride comfort. The Ninja 400’s larger-volume bodywork also offers great wind protection, further contributing to ride comfort. Flagship-Inspired Styling Elements – Influence from the Ninja H2 is evident in the chin-spoilers below the front cowl and in the design of the tail cowl. Twin LED Headlamps – In addition to contributing to the Ninja 400’s sharper looks, slim LED headlamps (each featuring low and high beams, as well as a LED position lamp) are highly visible and offer significantly increased brightness. 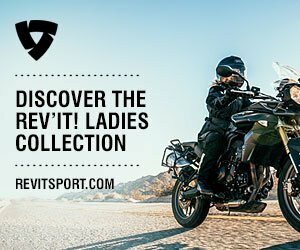 Visit Kawasaki to find a dealer near you!